Not too many words now, it was just perfectly wonderful. We really don‘t know what should have worked out better. So thank you so much to everyone involved from near and far on, behind and in front of the stage, at the bars, the doors and the stands, in the kitchen, on the mixers, on the walls and elsewhere for making this great night possible. To be continued. One family in struggle – together we can ‪#‎RockTheEmpireFromBelow‬! FIRE AND FLAMES FESTIVAL 2015 – THE RUNNING ORDER! 4 pm : Movie screening „Acta Non Verba – the renewal of antifascism it its struggles“ by and witht Hazem (Collectif Nosotros, Marseille). In cooperation with Rosa Luxemburg Stiftung Schleswig Holstein. 5.30 pm : Movie screening „Never Give Up – the buildup of the militant antifa-scene in Russia“ by and with What We Feel. PLEASE NOTE: The Film documents bestially acts of fascist violence! On the occasion of the historical charging of tomorrow’s date we accept ostmark at the bar. 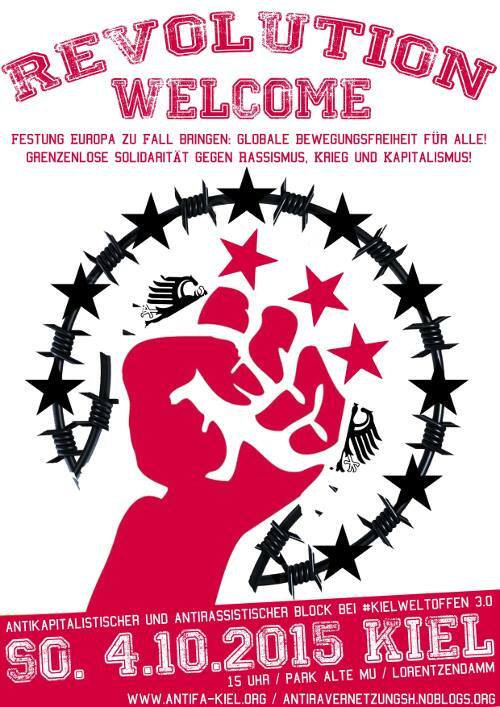 Rock together, fight together: For the day after our nice little festival at Alte Meierei Kiel next saturday, antifascist and antiracist groups call for a revolutionary participation at the broad demonstration for a cosmopolitan city in Kiel. So if you‘re hanging out here on sunday too, come along and show up 3pm at Ratsdienergarten (Revolution Memorial). 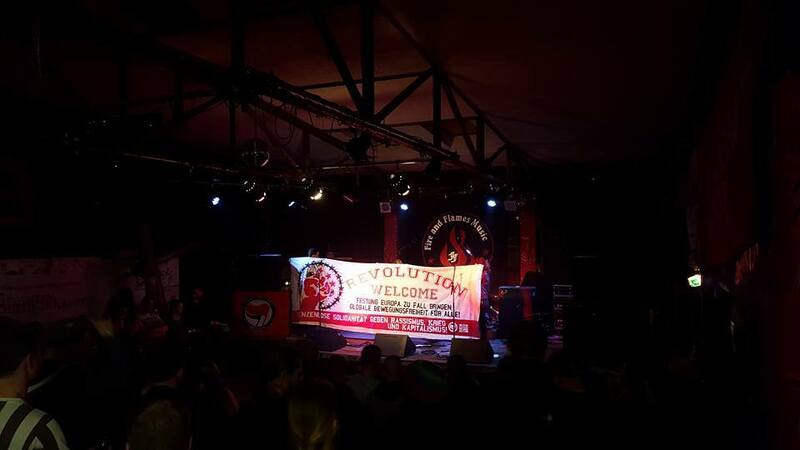 Freedom of movement is everybodie’s right – boundless solidarity against racism, war and capitalism! Warm clothes for you … with a message ! 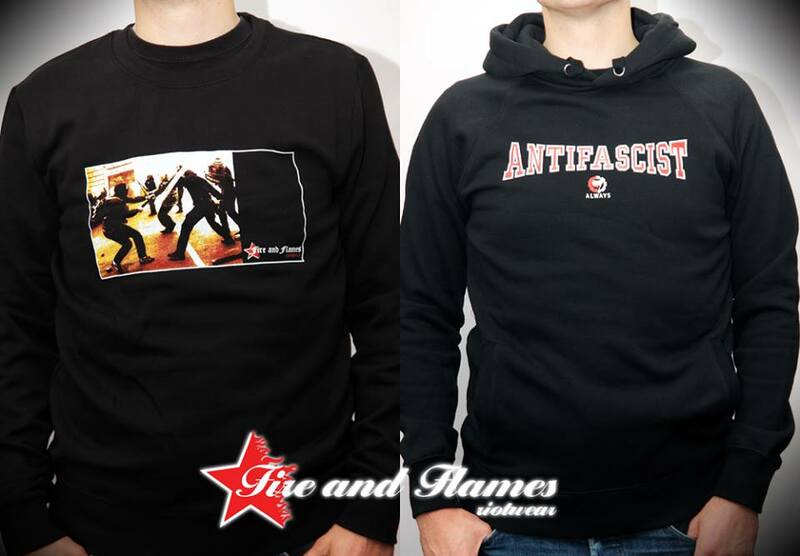 It’s getting colder and colder… But thanks to your favourite revolutionary clothing dealer you‘ve got the great opportunity to feel the heat although the summer’s over now: Two absolute FF classics – „Antifascist Always“ and „Dialogue“ – as sweater respectively hoodie now back in stock. Don‘t wait until the bad cold has got you comrade! Together with our comrades of the Rojavakommittéerna, a nationwide network of independent leftist and kurdish groups in Sweden, we distribute these shirts in solidarity with the resistance and the social revolution in the west-kurdish regions of Rojava. Many comrades lost their life in the brave and heroic fight of the People’s defence forces YPG/YPJ against the fundamentalist terror of the „IS“ and the attacks by the reactionary turkish state. No one is forgotten and nothing is forgiven! The sale is bounded in a current donation campaign of these comrades. The profits will directly be forwarded to Rojava to support the rebuilding of Free Kobanê. Support the revolutionary process in Kurdistan! Long live the resistance of Rojava! Du browst gerade in den Fire and Flames Weblog-Archiven nach dem Monat Oktober 2015.